The third set of molars, wisdom teeth, often emerge in the late teens or early 20s and can cause a great deal of pain and discomfort depending on the size of the patient’s mouth and position of the teeth. Impacted or partially erupted wisdom teeth can result in a number of problems including pain and trauma to nearby teeth and gums. When the teeth emerge properly and are aligned with other teeth, and the surrounding gum tissue is healthy, wisdom teeth can be left in place. Unfortunately, in most cases, wisdom tooth extraction is necessary when the teeth are restricted from suitably emerging within the mouth. 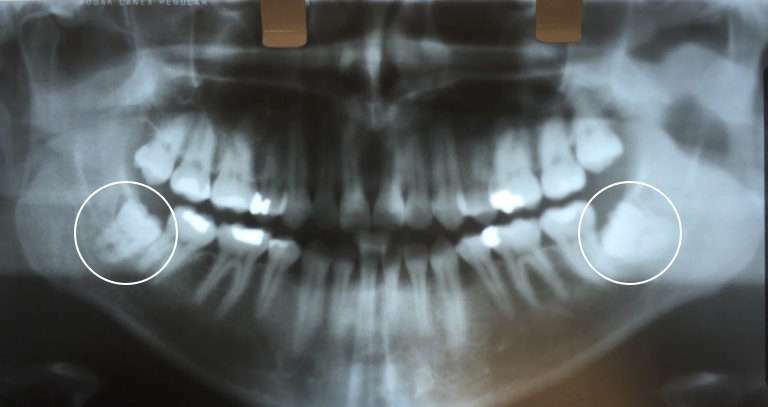 Wisdom teeth can erupt in a number of ways including growing in sideways, only partially protruding from the gum, and in some cases, remaining below the gum and bone, causing pain and pressure in the mouth. Impacted Wisdom Teeth can assume numerous positions in attempts to finally emerge from within the gums, resulting in pain and discomfort. As teeth move, pressure is created causing the other teeth in the mouth to cram closer together, and out their natural alignment and positioning. In addition to the severe discomfort felt during this process, once the impacted teeth do emerge, the gum around the erupted teeth creates an opportunity to let bacteria in, leaving patients at risk of an infection that is characterized by swelling, soreness and pain. Removing impacted teeth is the recommended solution to resolving these issues. The preventative measure can help relieve pain and discomfort, and is an important step in maintaining excellent oral health and limiting the chance for future illness. During the procedure, the doctor will administer IV sedation therapy and painkilling medication to ensure you are completely relaxed and experience no discomfort. Although you will be in a twilight sleep during IV sedation, you will be completely comfortable and most likely will not recall the surgery. Depending on the state of your wisdom teeth (partially erupted, unerupted or impacted), Dr. Aalam or Dr. Krivitsky will perform either a simple or surgical extraction. During a simple extraction, the doctor will remove the entire tooth in one piece. For more complex surgical extractions, the doctor will separate the tooth into several pieces for easier removal. As the only two board-certified periodontists in Brentwood and professors at the USC School of Dentistry, Dr. Aalam and Dr. Krivitsky specialize in tooth removal, and strive to ensure each patient is comfortable with the process and confident with their results. Although wisdom teeth extraction is generally regarded as a safe procedure, the success of your surgery depends, in large part, on the experience and qualifications of your oral surgeon. The outcome is affected by the quality of the periodontist’s training as well as his or her use of proper surgical techniques. In order to ensure a smooth recovery, Dr. Aalam and Dr. Krivitsky utilize only the most cutting-edge treatments and technologies available to minimize side effects and discomfort and improve oral health and appearance. Following a wisdom tooth extraction, it is important for patients to take a few simple precautions to help prevent potential complications during the recovery period. For example, patients are advised to not smoke cigarettes at least one day after a tooth extraction, to consume only soft foods for a few days, to avoid drinking from a straw and drinking carbonated drinks. A periodontist will prescribe pain medication to help you manage the discomfort felt after the surgery, and in some cases an oral rinse to ensure the surgical site is kept clean and heals properly.